In conjunction with the museum’s current exhibit, “Fine Portraits, Fine People,” we present Anca Colbert’s recent Ojai Quarterly essay on the art of photographic portraits, which focuses on Ojai’s own Guy Webster. The celebrated Paris Photo Show came to Los Angeles for the second year last April. The event, held at Paramount Studios in the heart of Hollywood, attracted the interest of the press, celebrities and a public eager to look, get informed and collect new artworks. “Portraits of Our Time,” a monumental limited-edition book of Annie Leibovitz’s work just released by Taschen Books, was drawing crowds and creating a sensation at their booth.On the heels of the two previous fairs held in January, the Photo L.A. show and the Classic Photo show, the huge success of this international event confirms the strength of the photographic art market, and the growing importance of Los Angeles as a city that supports this young and popular art form. In the Spring 2014 Issue of the Ojai Quarterly we considered the accelerated evolution of photography as a technique and as an art, and the difference between a snapshot and a photograph. We continue our series on photography by taking a closer look at photographic portraits. Painted portraits were part of art culture for centuries. To this day, Da Vinci’s “Mona Lisa” remains the most celebrated and mysterious of all paintings. But ever since the birth of photography around 1850, portraits in the most accessible and democratic of all art forms have captivated a wider audience, always hungry for more images, and in recent times with an ever-increasing appetite for personalities. From Nadar and Stieglitz to Gertrude Kasebier, Man Ray, August Sander, Cartier-Bresson, Henri Lartigue, Brassai, Diane Arbus, Mapplethorpe, Cindy Sherman, Irving Penn and Richard Avedon, we all have our favorites. So, what’s the fascination with portraits? And what exactly are they? Are portraits able to capture the psychological character of the sitter? How “personal” is that image of a person? Portraiture is commonly regarded as a window into the soul of the sitter. But is it? Could it be a window into the soul of the photographer? Photographic portraits, which fast surpassed the popularity of traditional painted portraits once the technology was available, are perceived as a way to capture reality. But how much do they, really? Whether in studio settings or in photojournalism circumstances, a psychological layer adds a twist to the situation, as Richard Avedon plainly put it: “A photographic portrait is a picture of someone who knows he is being photographed.” As we look at a portrait, we look at the dynamic interaction between an artist and a sitter, and at the energy in that space between them. 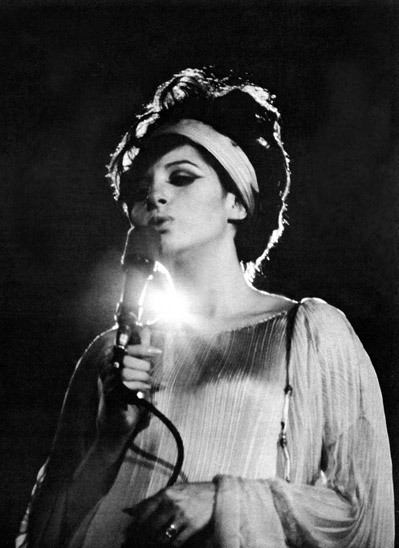 Barbra Streisand at the Hollywood Bowl, 1960s. Photo: Guy Webster. Photographic portraits are an interpretation of the reality of the person being photographed, as imagined by the photographer, and as perceived by the viewer. It’s all illusion, played by a trio. Ojai is famous for being home to artists and creatives. Among the distinguished photographers who have lived and worked here are Horace Bristol (renowned for his photos of Dust Bowl migrants), and more recently Cindy Pitou Burton, Donna Granata and Guy Webster. Guy Webster moved to Ojai 34 years ago. While he still commutes to his studio in Venice for weekly shoots of celebrities, he loves his family life in this heavenly valley, where he rides one of his many motorcycles every day. Guy loves speed, and motorcycles are his lifelong passion. One of the early innovators of rock ‘n’ roll photography, Guy started by shooting album covers and billboards in the 1960s for groups that included the Rolling Stones, the Mamas and the Papas and the Beach Boys among numerous others. As the primary celebrity photographer for hundreds of worldwide magazines, Webster has captured a vast range of talent in the world of music and film, from Igor Stravinsky to Truman Capote, Alan Ginsberg, Zubin Mehta, Alan Watts, Sean Connery, Mick Jagger, Jack Nicholson and Michelle Pfeiffer to his longtime Ojai friends Malcolm McDowell, Mary Steenburgen and Ted Danson. Born and raised in Beverly Hills, Guy became a photographer by accident. It was 1961; he had just graduated from Yale and gotten into the Army. While stationed in Carmel, he volunteered to be a photography instructor without knowing anything about photography. He spent the night reading up on the subject, and the next day started teaching it! 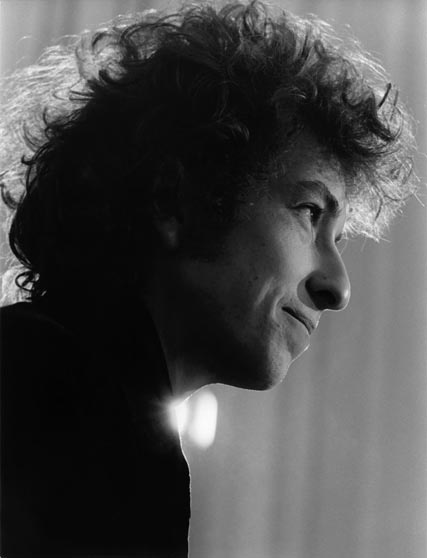 Later, back in Los Angeles, he had connections with some rock ‘n’ roll groups and record companies. The photograph that made him famous was the 1965 record cover of the album California Dreamin’ for The Mamas and The Papas: he shot them in a bathtub. After that, Guy says everybody in Hollywood wanted him to photograph them; it was the beginning of his stellar 50-year career. The essence of photography is light and shadow. Guy Webster’s portraits speak that language fluently. I brought up my keen interest in the light quality of his portraits, particularly in his black and white work; he was pleased to tell me about his love for Italian painters, Caravaggio in particular. Caravaggio’s illumination of his subjects, known as Tenebrism, is a technique similar to chiaroscuro by which strong contrasts of light and dark are used to add emotion and drama to an image as if seen through a spotlight effect or illuminated by a candle. Other Baroque painters used that technique with memorable results, notably Rembrandt, Rubens, La Tour and Vermeer. 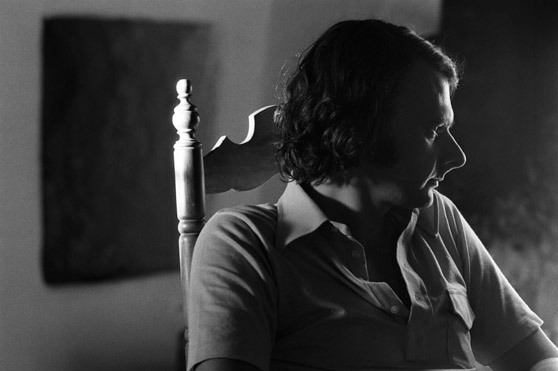 Guy Webster’s portrait of his friend John Nava offers an interesting reflection: double take on the painter living in Ojai, world renowned for his portrait work. Webster catptured the interplay of light and shadow in his old farm house in Spain, every subtle transition in the fabric of the shirt and on the wood of the chair, and the profile of the painter gazing intensely at what we cannot see. In his early portraits of Barbara Streisand and Bob Dylan, it’s interesting to note the light glowing around their throat area, a subtle indication of their golden voices. Igor Stravinsky at home in Beverly Hills, 1967. Photo: Guy Webster. 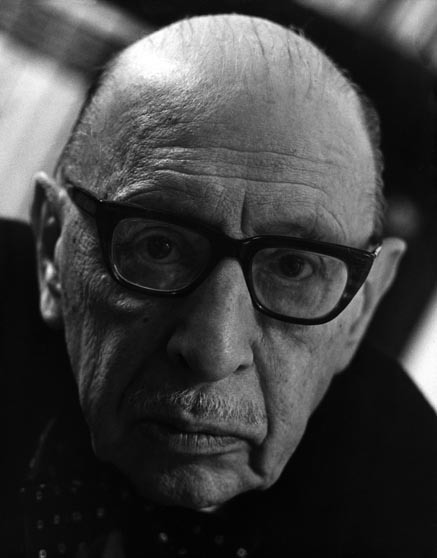 Columbia Records sent Guy on an assignment to photograph Igor Stravinsky at his home: he captured the composer, whom he immensely admired, in a very close-up frontal shot and at an angle focusing the light on the composer’s large forehead, clearly intending to give a hint of his genius. A savvy storyteller, Guy exudes intelligence and calm. There is kindness, even sweetness, to his portrait work with celebrities — no doubt a reflection of his own temperament projected onto his sitters. 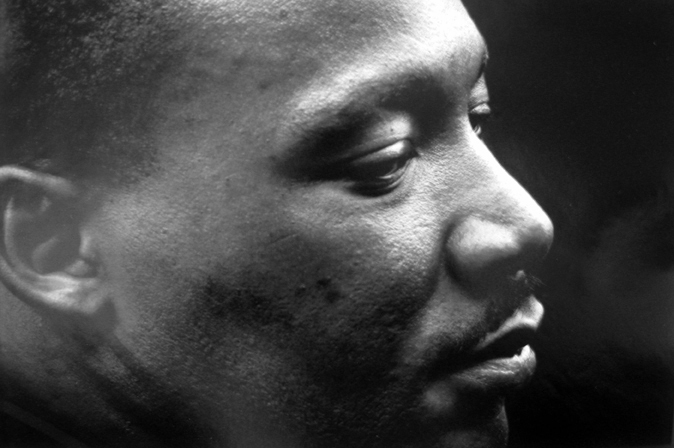 Martin Luther King Jr., Aug. 28, 1963. Photo: Dan Budnik, courtesy Peter Fetterman Gallery. In my book of art life, to be moved to tears by an image is always a good sign. Art has that power to touch us deeply. As the fascination with portraits retains its appeal with art lovers and remains an essential form of expression for professional photographers, photography continues its irresistible ascension as the visual art form of our times. Anca Colbert is an Ojai-based art consultant and curator; the editor and publisher of Arts About Town, a guide to the arts life and activities in Ojai; and the arts columnist for the Ojai Quarterly. This column first appeared in the Quarterly’s Summer 2014 issue. Republished with permission. Much appreciate your featuring this recent article of mine in conjunction with the current exhibition at the museum.